Shake the beef stew meat in a resealable plastic bag with the flour & seasoning salt until evenly coated. 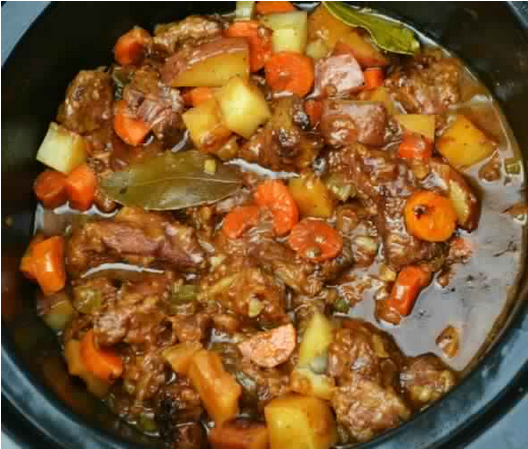 Heat the olive oil in a skillet; add the floured stew meat to the pan & brown on all sides. Remove using a slotted spoon or tongs & place into the bottom of a slow cooker. Season with pepper. Saute the diced onion in the same hot skillet for 2 minutes. Don't worry about cleaning it out in between - that's added flavor! Transfer the onions into the slow cooker as well. Pour the Worcestershire sauce, water, & beef demi glace (or Swanson Flavor Boost) into the skillet and whisk until mixed, making sure you scrape up any browned bits in the bottom of the pan. Turn off the heat & set aside. Add the diced potatoes, carrots, celery, & bay leaves to the slowcooker. Now, pour the broth/Worcestershire mixture in the crockpot as well. Cover; cook on low for 8 hours. Remove the bay leaves before serving.